Half sketches create a story in pictures too, relevant history. Real last-century French pioneer filmmaker Georges Méliès collected mechanical robot-like automata, and, impoverished, worked at a toy booth in a Paris railway station. Here, orphan Hugo fixes his late father’s automata, and meets Méliès through his god-daughter Isabelle. There are not enough ways and words I can use to tell you all how much I adored this book. It is absolutely spectacular. Do not let the 525 pages frighten you off. It is a fairly quick read, the writing takes up little space on the page and a lot of the story is told in stunning black and white sketches. 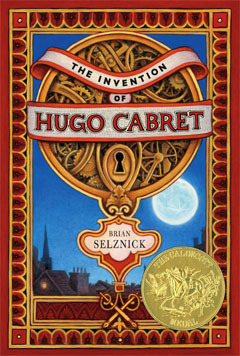 This is the story of Hugo Cabret, a young boy living in the walls of a train station who discovers a secret. I will not ruin anything else and I will hint at nothing. This book is touching and heart warming, it is I’m assuming fiction wrapped in an element of reality because a lot of what is mentioned is very true, but the surrounding story is not. Selznick’s characters are wonderful, even when they appear not to be. They play their parts very well and they are as real and believable as any living person. The actions of this young boy, the adults in the station, everyone who we see in this book you understand completely even before you realise why you do. Children are children and adults try their best at being adults. Secrets and hidden information do not make these characters less real. As soon as Selznick introduces a character you somehow manage to see their entire selves in the small space they are given. Anything else revealed after that only adds more and makes the story even greater and more moving. What this story does is it draws you into this world, you see everything so clearly even without the help of the pictures. The part truth it tells makes it sorrowful at times but remarkable and fascinating at the same time. Anything based on true stories always makes me that much more involved emotionally because the events were real and did manage to change or impact someone’s life, but even these truths mixed with fiction is enough to get caught up and teary eyed at what Selznick is trying to portray. Yes I know there was a movie, but read this book, if not first then read it after. They are so close so you won’t have to choose which one was better but this book offers just as much as the movie does if not more. There are pictures, there is writing, there are sketches and photographs, it is everything. What Selznick does is he uses these pictures to tell the story. As I say, don’t be scared of the 525 pages. There are one hundred and fifty eight different pictures and twenty six thousand and fifty nine words and every single one tells this story. Don’t ask me how I know, read the book and you’ll find out.